People around the world enjoy flowers in their food. Asian cuisine, for instance, relies on lilies and chrysanthemums, squash blossoms are common in Italian and Latin cuisines, and the French use carnations for Chartreuse, a traditional liqueur. Rose petals and rose hips are popular with home cooks and professional chefs alike. While the nutritional benefits of rose petals are negligible, they do add benefits beyond their nutritive value. Rose petals don't offer a lot in terms of nutrition, according to an online calorie counter, but they can add flavor, adventure and the scent of roses to your culinary creations. 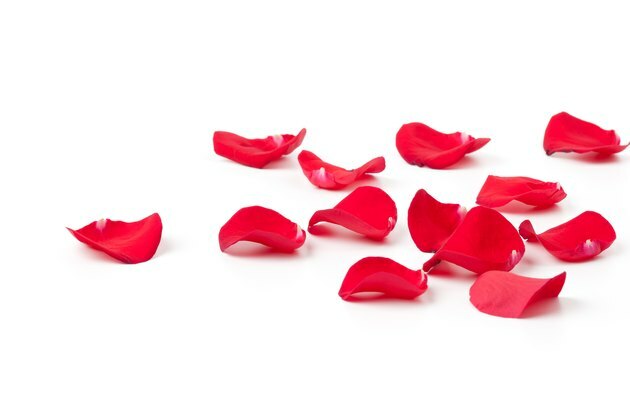 Because rose petals are about 95 percent water, their nutritional value is limited and their calorie count is low. However, they do contain some vitamin C, though less than that found in rose hips, the fruit of the rose that appears after the flowers drop. Ancient Chinese medicine used roses to treat digestive disorders, the pain from injuries and menstrual irregularities. Eating a varied diet full of interesting foods is the best way to ensure that you get plenty of vitamins and minerals, and adding rose petals to your repertoire may encourage you to explore new cuisines. Middle Eastern cuisine, for instance, uses rose water and rose petals in a variety of dishes such as Persian stuffed dumpling squash with rose petals. Cooking with and eating roses can make you feel good. Leon Seltzer, a clinical psychologist, writing for Psychology Today, explains that the delight of discovery — of being spontaneous and adventuresome — can make you feel good about yourself. Eating rose petals may seem like a trivial activity, but if doing so reminds you to savor your food and your life, it will take on a deeper meaning. In eating, as in life, establishing links with the past is vital to your well-being — witness the feelings that arise when you eat pie made from your grandmother's recipe or the beef chili that you know generations of your Texas relatives have enjoyed since pioneer days. Eating rose petals can transport you to ancient Rome, where roses were added to foods when a celebration of victory occurred. You can also travel to the White House in the late 19th century, where the chefs made pound cake with a glass of rose water according to The White House Cookbook (1887). If you want to use rose petals in your culinary creations, it's best to try out your green thumb and grow your own rose bushes. Planting your own allows you to know precisely what fertilizers and pesticides are on the plant. It's best to avoid chemicals altogether and choose fertilizers that are safe or try your hand at making homemade fertilizer. Most rose bushes need full sun and rich, well-drained soil. Colorado State University offers a few tips for using a variety of flowering plants in your foods. Pick flowers in the morning and use them at their peak to enjoy their best flavors. Avoid flowers that are wilted, faded or unopened because they won't have the best taste and might be bitter. Try a small number of petals first to check for allergies or stomach upset. Get creative with your rose petal dishes. Look for recipes that add rose petals to beverages such as lemonades, juices or teas. You can also create rose-scented sugar to sprinkle on baked goods or to sweeten your favorite drinks. Rose petals can be added to salads, butters and granola, and steeped to make make rose water. The possibilities are nearly endless. With a little planning and research, you can add rose petals to many of your favorite dishes. Before you know it, you'll feel that everything's coming up roses.